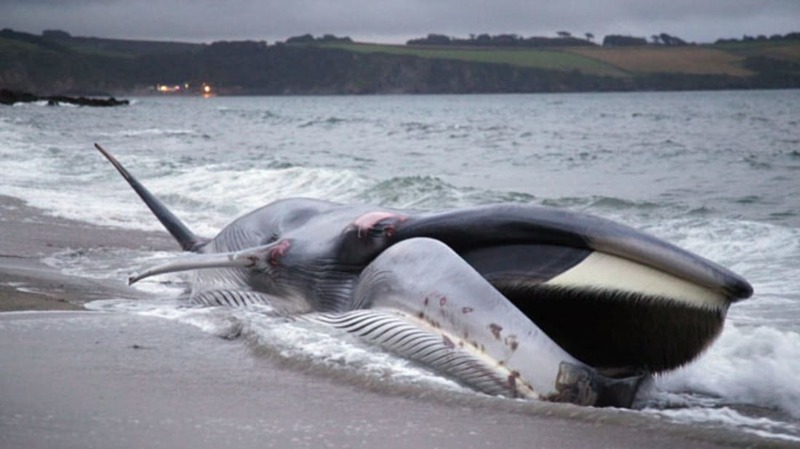 Humans have observed marine mammals stranding themselves on land since at least the first century CE, when the ancient Romans and Greeks recorded beaching incidents. Modern marine biologists are only able to determine the cause of a beaching about 50 percent of the time, according to the Woods Hole Oceanographic Institution, and the reasons they find are varied. Often the cause is obvious injury or illness. Disease or wounds from predators can leave an animal too weak to keep itself afloat, and at some point it gives up and lets the tides wash it ashore. Cases where a group of animals beach themselves together, and not all of them exhibit signs of trauma, are more puzzling. One explanation biologists offer is that whales and dolphins, which hunt and travel together in groups called pods, fall victim to their own social structure. If the group leader or dominant animal is sick or hurt and runs ashore, the rest of the group might follow. Other times, the pod may just get itself stuck by a low tide after hunting or traveling too close to shore. In some instances, mass beachings have occurred shortly after active use of military sonar in an area. In 2000, for example, 17 animals from four species (Cuvier’s beaked whale, Blainville’s beaked whale, Minke whale, and the spotted dolphin) were found beached within a 36 hour period in the Bahamas the day of, and after, a U.S. Navy sonar exercise. A joint Navy and National Oceanic and Atmospheric Administration (NOAA) investigation soon concluded that the tactical mid-range frequency sonars used by the Navy ships “were the most plausible source of the acoustic or impulse trauma” that occured. The evidence suggests that sonar may have both physical and behavioral effects on marine mammals. Some animals also beach themselves purposefully as a hunting tactic. Killers whales, or orcas, frequently chase pinnipeds, like seals and sea lions, into the surf zone and onto shore, where the prey has to make a clumsy transition from swimming to walking in shallow, turbulent water. As the prey struggles to escape, the orca launches itself, or rides a wave, onto the beach and grabs the prey in its jaws. After the meal is secured, the orca can either wriggle back into deeper water or let a large wave lift it off the ground and back out to sea.